That the U.S. is “an exceptional nation” obliging it to lead the world, using force without hesitation whenever necessary, might well be questioned by many, particularly in light of the ineffective – or one might say disastrous? – policies instituted over the past fifteen years, policies which, I might add, both Morell and Clinton were parties to. Contrary to Morell’s assertion, a hawkish Hillary Clinton has never hesitated to put young Americans or anyone else in “harm’s way.” His advocacy of Hillary’s promotion of using military force to overthrow Bashar al-Assad in Syria can be easily challenged by even cursory reflection on the dreadful results produced by similar efforts in Afghanistan, Iraq and Libya. A Syria with no government or a regime made up of a mixture of enemies of al-Assad would have become an open door for the development and expansion of ISIS, which is currently being most effectively opposed by the Syrian Army. And the Russians. As for the clincher about Trump being a Moscow run Manchurian candidate, I would suggest that Morell might have been a top analyst at the Agency but he never acquired or ran an actual spy in his life so his comments about The Donald having been recruited by Putin should be taken for what they are worth, which is precisely nothing. Indeed, as I have noted, calling someone an “unwitting agent” is itself meaningless as it implies being somehow recruited to engage in espionage but without realizing it and without being actually called upon to do anything. I would doubt that many real CIA Operations Officers would agree with Morell’s glib assessment or use such an expression. Trump for all his failings is presumably patriotic and no fool. He just might understand that dealing with a powerful foreign leader who is not completely to one’s liking just might be better than nuclear war. Perhaps Morell and Clinton should consider that option. Is Morell looking for a Job? Throw in the neoconservatives as the in-your-face agents provocateurs who provide instant intellectual and media credibility for developments and you have large groups of engaged individuals with good access who are on the receiving end of the seemingly unending cash pipeline that began with 9/11. And the good thing about a well maintained pipeline is that it keeps on flowing. Is Michael J. Morell anticipating a high position in the Hillary Clinton Administration? You betcha. CIA’s Morell Cozies Up To Clinton – Looking For Work? 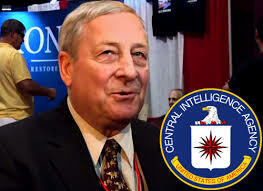 Philip Giraldi discusses this issue with Ron Paul on the “Liberty Report”. This entry was posted in CIA, Hillary Clinton, Michael Morell, Philip Giraldi and tagged CIA, GOSINT, Michael Morell, Philip Giraldi. Bookmark the permalink.